Syd Hoff (1912-2004) would have been 100 this year. As readers of this blog will know, I corresponded with Syd (here’s one letter & here’s another) while researching my biography of Crockett Johnson and Ruth Krauss (coming this September)! 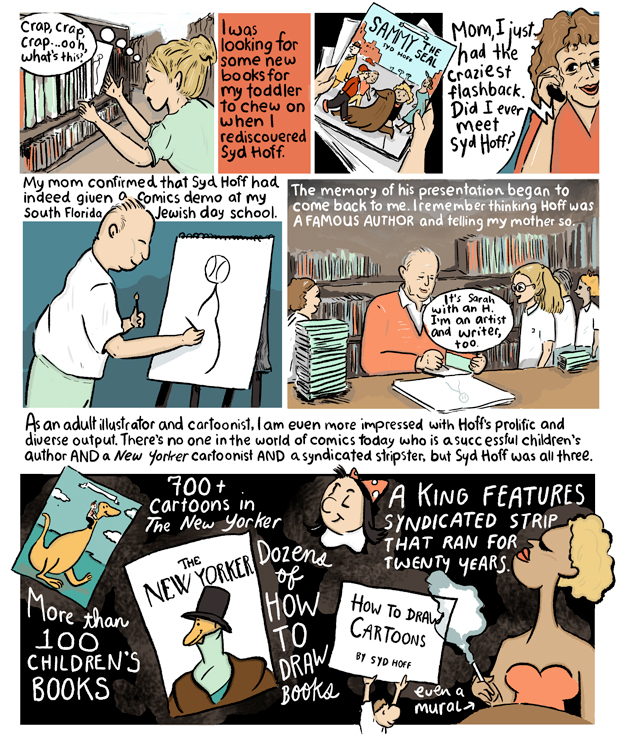 In commemoration of Hoff’s centennial, Sarah Lazarovic has created a wonderful cartoon, based on Dina Weinstein’s exhibit at the Miami Public Library (June 14-October 1, 2012). Here’s the first page of her cartoon (click to enlarge). The entire comic is on-line at Tablet: A New Read on Jewish Life. See her website for more of her work. Syd Hoff, A. Redfield, and Me (23 Nov. 2010). A letter from Syd to me, with annotations. Syd Hoff, A. Redfield, and Me: Part II (30 Oct. 2011). Another letter from Syd to me, with more annotations. Syd Hoff’s Teeth: The Leftist Satire of A. Redfield (2 Feb. 2011). Some of the Daily Worker cartoons collected in The Ruling Clawss. Artists for FDR (20 July 2011). Features cartoons by Hoff, Crockett Johnson, and Hugo Gellert. Syd Hoff: Finding Home. Curated by Dina Weinstein (scroll down for the description). The exhibit runs from June 14 to October 1, 2012. Syd Hoff’s Cartoon Life. By Sarah Lazarovic. The full three-page comic from which the above excerpt comes. Hat tip to Julia Mickenberg for Lazarovic’s comic.